What dog doesn’t like going for walkies? Bobby (otherwise affectionately known as Doggy Dog, Bob Bob, Bobster or Noodles) certainly loves them. In fact he bounces around like a rabbit and races to the front door the moment you said “walk…(runs)…ies”. I then have to hunt around for his lead along with his little poop bags. Nightmare, especially when a rather hyper dog scratching at the door dying to go outside. This is where The Doddle comes in. 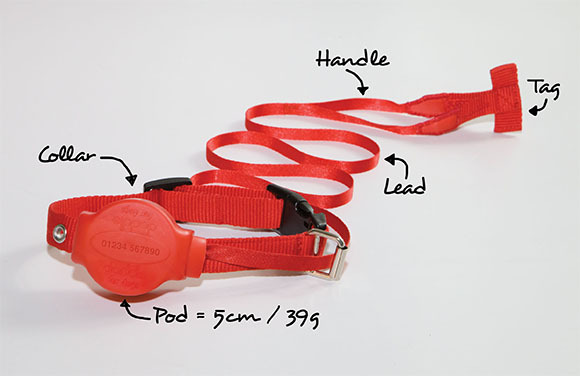 The Doddle comprises a strong nylon webbing collar with a built-in retractable lead that has a looped handle. Once you fasten the collar you have a built in lead that is always on the dog. The durable plastic pod contains a reel of high strength nylon webbing which pulls out to a standard (1m) length retractable lead with the looped handle for immediate control. So a collar for your dog with an in-built retractable lead? Sign me up! I put the Doddle to the test (not a huge fan of the name, I have to admit) with Bobby and my 3 year old nephew Oliver. As usual, Bobby was excited as ever albiet rather confused as to why I took off his old collar and popped on his new shiny red one. 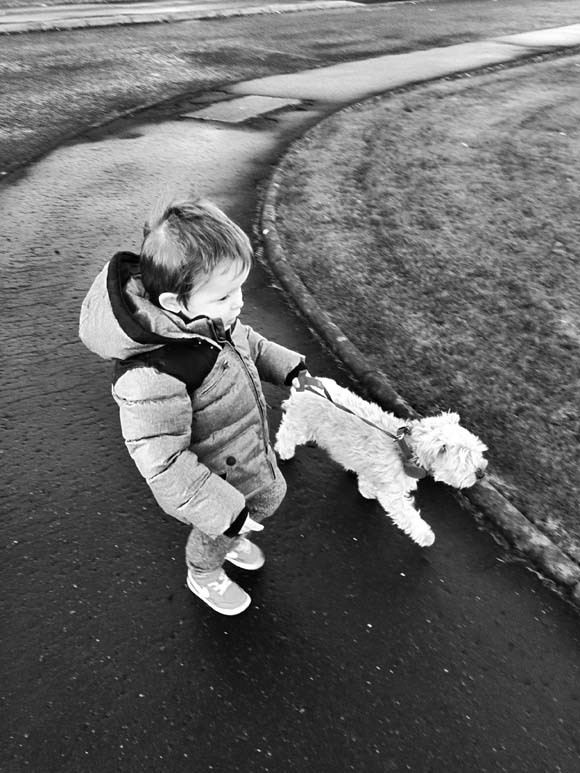 Every time Oliver is at the house, he loves playing with his best buddy and wants to take him for a walk himself. Available in two sizes small & medium, I found that the retractable lead is the perfect size for the little people in your life. The looped handle is great for little hands to cling onto and because the retractable lead isn’t as long as a normal lead (I estimate it as just over a metre in length, maybe? ), you don’t need to worry about your dog running away too fast with you (or a little person) being dragged behind. With myself, I found that the length of the lead wasn’t really suitable for walking Bobby. He’s the type of dog that loves to roam in front of you. With my height (5’7) combined with how small Bobby is (he’s a Yorkshire Terrier), he could only walk along beside me and couldn’t bounce away as per usual. I thought that Bobby may not like having the Doddle as his new collar as it is rather bulky in comparison but he honestly didn’t have any issues with it. He was even able to have a little snooze with it on. Oliver had a blast walking Bobby. I also cannot confirm nor deny that he may have had a little accident when Bobby got spooked by a giant dog (he’s petrified of other dogs!) and tumbled over him on the pavement. No cuts or bruises, so it’s all good! Oliver cried his little eyes out when it was time to go back inside the house. Now, it’s his special treat every time he’s over. Fun times all around. I don’t think the Doddle will take over fully from Bobby’s normal collar, but it’s great for when you’re travelling, want to walk the dogs with kids or have dogs who aren’t little impatient explorers! To learn more about them, check them out on Facebook and Twitter.